Here is a photo of the crew that that went along to Simon’s (in pink) 21st a few weeks ago. 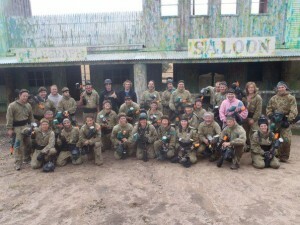 A great day had by all (If bruises are ignored), with plenty of Rambo action and a good competitive spirit. The weather was almost ideal, with a little rain to cool us down. A bit unknown who won the day? Do you go by field wins, kills, or number of bruises. Maybe the best score is the amount of fun had. Some are anxious to do it again, some will probably do it again, and some may not do it again! We had some pretty sore bodies, with some pretty ugly bruises, with some people very keen to show them off.